My most favorite conservative talk show host and author, "Dr." Laura, has a new book out, "In Praise of Stay-at-Home Moms," in which she's once again fanning the flames of the mommy wars to encourage mothers to stay home with their children instead of having a career. While I did not run out and buy it, I've read a few interviews she's done to promote it, and I thought I would share a few of her pearls of wisdom. In this interview, the good doctor was asked how she could recommend living on one income to a couple who needs two incomes in order to make ends meet, given the horrible state of the economy. Unsurprisingly, she side-steps the question, says that it's really the rich who are suffering because of the economy and not the middle class, and then says she's "happy as peach pie," (because she's "all about the children and the happiness of a woman") that "nannies, day cares, and babysitters are all collapsing, which is forcing moms and dads to raise their children at home." Yes, you read that correctly. She's happy that nannies, day care workers, and babysitters (most of whom are the very women whose happiness is allegedly so important to her) are losing their jobs, and that parents must now scramble for alternate means of childcare. Apparently, she doesn't care too much for the happiness of the children of those nannies, day care workers, and babysitters, who are now suffering because their mothers lost their income. She goes on to say that less cash seems to make people happier. Hmm... not in my house. Less cash makes me worried and cranky, and generally does not make for a happier mommy. According to Dr. Laura, women hesitant to leave their jobs are "spending too much time thinking about what they have to give up, and feeling angry about not being valued." She has this advice for those women: "When your husband comes home, wrap your body around him at the door and look at his eyes" and says that "Kids who don't have moms suffer a lifetime," which is Dr. Laura-speak for "Kids who don't have moms who stay home with them suffer a lifetime." I think it's this charge that irks me the most. The implication that children are being irreparably damaged by their working mothers is flagrant misogyny. There have been so many times in the past 1.5 years since I quit my full-time job to freelance that I've thought I would make a much better mother to my children if I worked outside the home. I would have more patience. I would have more tolerance for the constant crying that is as much a part of my household as the cat hair and dust bunnies. I would make Playdoh cookies, read the same book seven times in a row, and draw pictures of Clifford much more willingly, because I hadn't done the same tasks just an hour before. I have many, many friends who were raised by working mothers, and guess what? They are some of the most well-adjusted, successful, and (GASP!) happy people I know. Dr. Laura is a working mother herself, which makes her assvice all the more comical. "I’m sure the überfeminists would recommend that the touching alternative would be to stockpile reports and videos taken by day-care workers, nannies, and baby-sitters, so that if the worst does happen, and a child is lost, you still have those memories … just through the eyes of other people." Because of course, if you're a working mother and your child passes away, you would have no memories of him and no special moments to treasure. The implication that a mother who works outside the home is not a full-time mom, is no more present in her child's life than the UPS man, and is being selfish by working either a.) because she has to in order to make ends meet, or b.) because she loves her career and finds it fulfilling, is nauseating to me. I've said this many times on this blog before: feminism is about choice. You are not a bad mother because you work, and you're not a hero because you stay home. Making the choice for either path is a decision that each woman or family makes for herself (or themselves). Staying at home with kids is not something every woman is cut out for (and even though I'm home and working, I put myself in this category. It is by far the hardest thing I've ever done and most days, I don't think I do it very well.) To lecture women that this is the path they should take regardless of their individual economic situation, temperament, and desires is not only incredibly short-sighted, it's shockingly ignorant as well. Do we really need another book that pits mothers against each other? I think not. 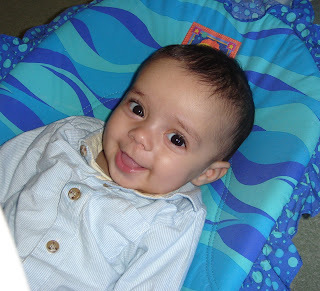 Because I am a masochist, I decided to tackle the trifecta of potentially explosive toddler rites of passage in a single month: potty-training, first haircut, and binky-weaning. As you know potty-training and Isabella's first haircut went spectacularly well, much to my complete surprise. For a little girl who vehemently resists any modification to her routine and the status quo (much like her father), Isabella exceeded all my expectations. And thank God, because mama would not have had the patience to deal with her if she hadn't. 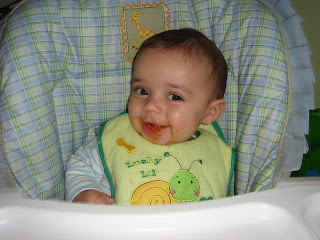 But the binky-weaning ran a close second to my fears about potty-training. Even though Isabella only used it for naps and bedtime since she was about four months old, she was really attached to it. It was part of her bedtime ritual. We would brush her teeth, dress her in her pajamas, and then head to the bathroom to run her binky under the faucet. She preferred a "wet binky." Then, we headed back to her bedroom, read stories, she'd pop in her binky and go to sleep. 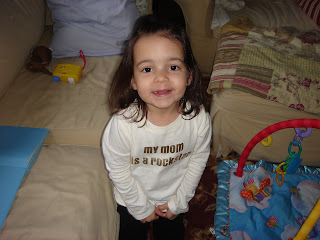 However, she's headed to the dentist soon for her first cleaning, I wanted to wean her off it sooner rather than later, since several of my friends received light scoldings from their kids' pediatric dentists once they confessed that their toddlers or preschoolers were still using them. I don't want to screw up her teeth, even if they aren't the permanent ones. And then there was the condition of her binky. Some kids have binkies. Isabella had one much-loved binkie since about the age of seven months. 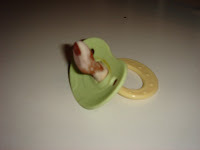 It was a stage one binkie, the smallest size, meant for infants. We tried to replace her binkie several times once we noticed how disgusting her favorite one was getting with no luck. She knew the difference, even if the replacement was the exact same size and color. 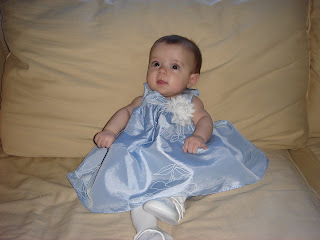 Her binkie was well-worn, discolored, and probably had at least 15 separate strains of bacteria growing on it. The thing was nasty. So, for about a week ahead of the big day, we talked about the Binkie Fairy and how Isabella needed to place her binky in a jar for the binky fairy to take away and replace with a present for her since she was a big girl now. On the day of de-binking, right after her nap, we had Isabella drop her binky into a jar and set it on the table in the hallway, just outside her bedroom door. She did this without a problem, and was excited about the present she'd find the next morning. But at bedtime, there were tears. Lots and lots of tears for the binky sitting in the hallway. She kept saying, "My mouth feels kinda funky! I want something in my mouth." I comforted her, tried to get her enthused about the present she'd find the next morning, and then finally asked her if she wanted to take something else to bed instead. She requested...a Kleenex. So I gave her one, and after a few more tears, she settled down and went to sleep. In the morning, Isabella found a Dora bubble kit and a Dora cup, plate, and bowl set waiting for her from the binky fairy. Luckily, she loved them. For that day's nap, she told me she was sad because her binky was gone, and then she requested two more stuffed animal friends to sleep with. At bedtime the next night, there wasn't a mention of the binky, although she was a bit more clingy than she normally is. As for the beat-up binky, I tucked it in my recipe box in the kitchen. Disgusting though it is, I cannot let myself toss it just yet. Making the decision to take away the binky wasn't an easy one. There are new signs every day that Isabella is growing up and becoming more independent. She's using the potty. She helps with chores. She is advocating to do everything herself. She's more articulate and verbal than some kids twice her age. She's sprouting like a weed. And I couldn't be more thrilled about how grown-up she is now. But she was never more my baby still than just before bed, dressed in her footie pajamas, curled up under her covers with her binkie in her mouth, ready for bed. Her binky is a tiny little piece of her babyhood that I'm just not ready to give up yet. Yesterday, Isabella turned 32 months old. There have been BIG changes in her world over the past month. As you may recall, we tried potty training her twice before. Once was a half-assed effort on my part last August just before she turned two. 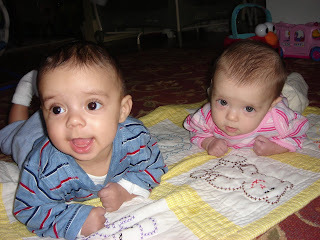 I was hugely pregnant with the twins and could barely stand up. I dressed her in underwear, set out the potty, and basically told her to use it. That was the extent of my effort. She had accidents all over the place and didn't care or feel embarrassed about it, so that told me she wasn't ready. Then, we tried again back in February with even more disastrous results. 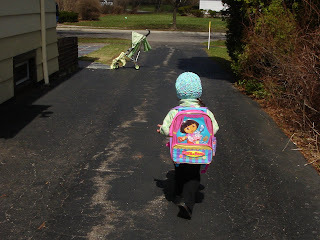 This time around, we talked up the first day of training (which coincided with the start of my husband's week-long vacation from work because there was no way in hell I was tackling potty training on my own) beginning weeks beforehand. On the big day of "no more diapers" we dressed her in underwear, told her to let us know if she had to use the potty, and left it at that. And guess what? She did. No drama. No hysterics. No fear. No crying. And not a single accident to date. On Day 1 she peed in it several times and left her other business for the pull-up we dressed her in for her nap. On Day 2, she was doing both in the potty without a problem, and looking for her M&M reward each and every time. Most often her pull-up is dry after her nap, and a few times it's been dry overnight. I am so incredibly proud of her. As ridiculous as it sounds, I literally had tears in my eyes as I watched her sit on the potty and go as if it were no big deal. 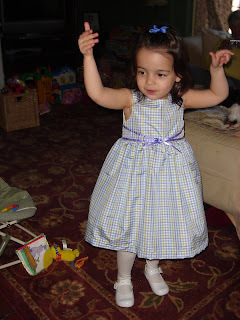 I was dreading this third go-round of potty training and was convinced we would be sending her to kindergarten in diapers, and she completely surprised me with how well she did. 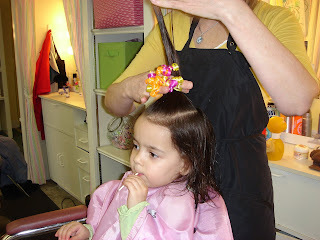 Isabella also had her first haircut this past month, another major event I was dreading. My mother had me convinced I would traumatize my daughter for life if I took her for a haircut. It seems my sister completely freaked out at the hair salon following the hack job I did on her long and flowing blond locks when she was three and I was four, and about a month ago, mamacita sent me a long email telling me that Isabella has rights and if she doesn't want to have her hair cut, I shouldn't take her because "she has a right to have her feelings honored and validated." I then asked mamacita that since Isabella doesn't like having her fingernails and toenails trimmed either, should I avoid cutting them also? I told her I wasn't donating one of her kidneys to science; I was having a few inches cut off her hair. Guess what? Isabella did wonderfully. 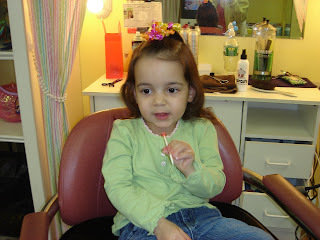 Of course, the lollipop she got to pick from a bucket and the strategically placed tvs playing Sesame Street at the salon where I took her might have had something to do with it. The stylist could have operated on her brain and Isabella wouldn't have cared. She even let the stylist put a fancy ribbon in her hair when she was done-something she usually fights me on at home. And again, I was so incredibly proud of her for being such a good girl. Isabella is really turning the corner on the abhorrent behavior she was exhibiting earlier this year. She picks up her toys (and the babies' toys!) without an issue now and even asks us, "Is it time for cleanup?" There are still some temper tantrums, but they are fewer in number. Dare I say that my two-year-old is actually pleasant to be around most of the time? Feel free to reach through the screen and slap me. She tells elaborate and imaginative stories with multiple characters and plot lines when we ask her to tell us a story (rather than the reverse, which she asks of us often). She's memorized quite a few books and "reads" them to herself. She's also becoming very fond of adverbs. 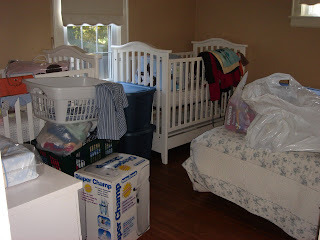 We must do things "very, very quickly" or she'll tip-toe upstairs "very, very softly" since the babies are sleeping. She also has a flair for the dramatic, as she likes to tell us she has a "terrible, terrible cold" as an excuse for why she doesn't want to give us or someone else a hug or kiss (when she's actually perfectly healthy). A fake cough often accompanies this statement. Today, Isabella went with the hubs to school for Bring Your Daughter to Work Day. He woke her up early, and instead of being a grouch as she usually is when awakened prematurely, she was happy and excited and gave me some huge hugs from her bed. I dressed her, put her hair in pigtails, helped her with her coat, and on her way out the door, she strapped on her Dora backpack that she's taken to carrying everywhere she goes. In that instant before she left with him, I saw the "big girl" in my baby. In September, she'll head to her own school, where she'll have a whole world open up to her-one that I'm not a part of. 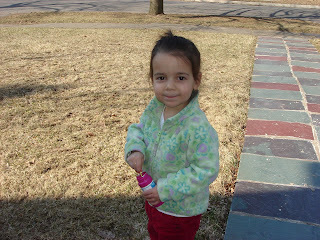 And as much as I'm ready for her to spend some time apart from me, it makes me sad that my baby is growing up so fast. I picked her up at 11am today from the hubs' school, and Isabella came running toward me, arms outstretched, and gave me an enormous hug. She wrapped her arms around me, put her head on my shoulder and said, "I told you I'd come back." Keep reminding your mama of that baby. This growing up stuff is hard on her too. 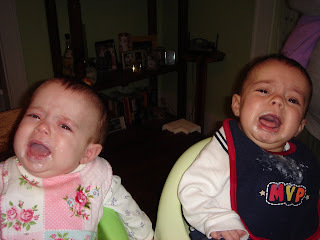 The twins turned six months old last week, so the week before we decided to throw caution to the wind and introduce solids. As it is with most major events, holidays, car trips, early mornings, mid-afternoons, evenings, and anytime I desire a photo of myself with one or more off my offspring, crying greeted the Delicious! and Not At All Gross! rice cereal I served. Lots and lots of crying. Break out the sharp sticks to poke into your eardrums following your viewing of the following, which documents not only Luci's extreme dislike of her rice cereal, but also her mother's annoying mommy voice and her big sister's love of the spotlight. 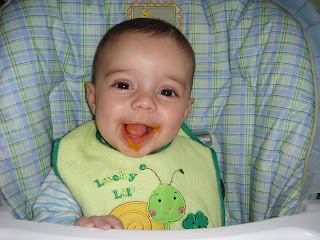 After a few days, I introduced sweet potatoes. The skies cleared, birds sang, and unicorns frolicked in my backyard. Nicholas is much more interested in eating solids than Luci. He gobbles, and she often acts as if I'm attempting to shovel pureed cockroaches down her throat. With Isabella, I introduced 10 or so veggies before any fruits, but this time around, I've already tried banana in an effort to encourage Luci's eating. I think it's working. Oh, and because I am bored and looking for ways to fill the many empty hours of my day, I've decided to dust off my grandma's ancient food processor once again and make the twins' baby food, just as I did for Isabella. Pulverized green beans, anyone? 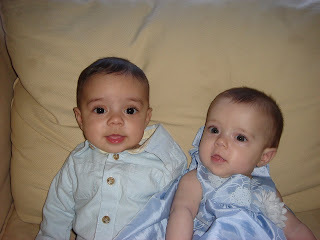 Luci and Nicholas are six months old today, and there have been lots of changes since last month. They've reached the stage where nursing is boring and they often spend a lot of time pulling away and looking at what's going on in the room, or the ceiling, the windows, etc. 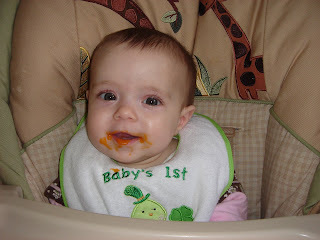 I rememeber feeding Isabella in the dark in my bedroom when she started doing the same thing. Oh, and Luci has begun the charming habit of biting me while nursing. She doesn't have teeth yet, but I have my suspicions that both she and Nicholas are teething. Of course, I thought Isabella was early on too, and we all know how that turned out. Their fine motor skills have really developed over the past month, with Nicholas just a bit ahead of Luci. They can both pick up toys and play with them, and Nicholas especially is chewing on just about everything. Luci has developed an odd pterodactyl cry that is quite amusing the first time, but run-out-of-the-room-with-hands-over-ears annoying the 16th time. Both she and her brother are becoming increasingly vocal, which is fantastic, just not at 2am. This past month, I achieved what I once thought impossible and have put the bambinos on a napping schedule. And I have them napping in their cribs rather than the swings! They nap at 9am and again at 1pm, just as Isabella did. Unlike their big sister, however, their morning nap is generally the longer and better one of the two. They will often nap 1.5-2 hours, but in the afternoon, one or both of them is up much sooner. Isabella would nap a painfully short 45 minutes-1 hour in the am, and then 1.5-2 hours in the afternoon. Nighttime sleeping is improving. There are fantastic nights where each one is up only once after a 10-11pm feeding, and then there are horrific nights when they're up constantly and won't settle back down. Nicholas, especially, seems to have a hard time settling back down at night, but will conk out immediately when placed in the swing downstairs. Hence, the hubs and I often sleep a floor away from eachother, since he hits the couch while Nicholas swings the night away. Also, several friends with twins have told me that twins who share a room learn to sleep through eachother's cries. I haven't found this to be the case at all. When I hear one of the babies crying (or even moderately fussing) on the monitor, I'm busting into their room faster than you can say, "Please dear God, don't let the nap end! ", to grab the awake twin and sprint with him/her down the stairs in order to preserve the sleep of the other twin. Luci's sleeping still remains a mystery to me. At times she seems to fight sleep. She's exhausted, and crying with her eyes closed, but she just will not settle, no matter what we try to do to help her. 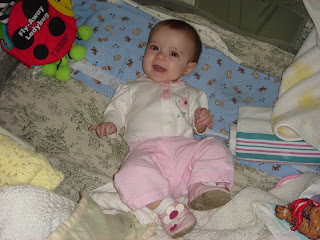 I'm very anxious to hear what her pediatrician says this week when we visit for their six-month checkup. Other changes this month include more enjoyable tummy-time, both babies rolling from tummy to back (no back to tummy rolling yet, though), and the start of solid food. More on this to come later. After a winter that seemed to last six years, spring is inching its way into upstate NY, so I am getting them outside, along with Isabella, as much as possible. I have been cooped up much too long inside a fast-becoming-waaay-too-small house, so anytime the weather is even moderately nice (Read: Not hailing and thunderstorm-free) I bundle up the kids and head out. We're taking lots of walks now, and with Isabella, Luci, and Nicholas (and the twins' infant carriers) loaded onto my gigantic, 35-pounds-when-empty stroller, I'm pushing close to 100 pounds, so hello future gun show! I've also taken a few more trips with just the kiddos and no extra help, and surprisingly, the world kept spinning on its axis. As this is essential to my freedom, the more trips like this I can take, the better. They are still very small when compared to full-term babies, Luci especially. They're both still in Size 1 Huggies, and wear 3-6month clothing, although some bigger- and some smaller-sized clothing fits them. I'll update this post Friday with their weights when they have their checkup. In general, I feel a lot more calm this month. I wouldn't say we're approaching anything near "normal" and much about our life is still in a constant state of chaos, but I don't feel as anxious or overwhelmed as I did even as recently as last month. Both babies are still off the chart for both weight and height (meaning below the 5th percentile) but they are growing on the curve at an appropriate rate. Easter is the busiest and craziest holiday in our household. We have a packed schedule of activities that takes us from morning mass to brunch at the hubs' aunt on one side of city, back to our house for a quick nap for the kids, followed by dinner at my grandma's on the other side of the city. Doing this amount of packing, unpacking, and schleping of three kids under the age of three, two of whom were all, "Where the hell are we going now?" for most of the day was a challenge. But, like everything else in our lives from this point forward, we just need to learn to adapt. Having three kids this young makes everything a bit more difficult. The festivities began on Saturday, when we left the babies with my mom and headed over to the hubs' parents' house for egg-dyeing and an Easter egg hunt with Isabella's cousins. 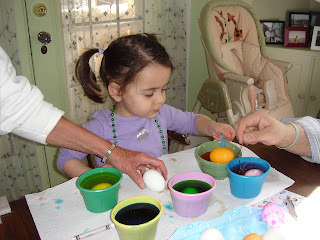 Later that night, we colored eggs again at our house. We now have enough hard-boiled eggs to last us until at least the 4th of July. 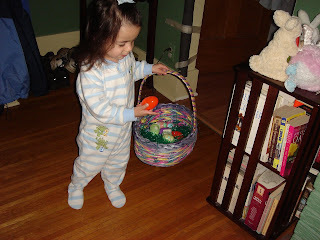 Once Isabella went to bed, we filled some eggs with money (the little girl's a fan of cold, hard cashola these days), a few chocolate bunnies, and some jelly beans, and stashed them around the house. 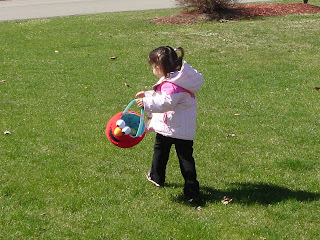 We also put out her Easter basket for her to find on Sunday morning. Then it was time to get dressed and force the children to pose for an obligatory family photo. The ones of the five of us were very bad. Very, very bad. In every holiday photo we've attempted to take together, someone is always crying. So it was with the Easter photo. Luckily, the kids' photo shoot didn't take anywhere near as long as the 4-hour-long Christmas photo nightmare. 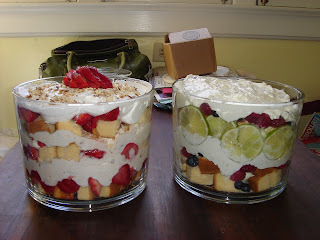 Oh, and I managed to make these two trifles (Strawberry Cream and Lime Berry Mousse) while the kiddos were napping for dessert at my grandma's. I may not be baking anywhere near as much as I used to, but my friend gave me these Pampered Chef recipes and they were easy...especially considering she dropped by halfway through to drop off Easter presents for the kids and helped me make them! Do you (or did you) let family members or friends drive your young children places in their vehicles? Click on over to my blog on Grow Together to read my thoughts on this topic. I'm interested to hear what you think, so please comment there (you'll need to fill out a quick registration form first-it only takes a minute) or come back here to leave your thoughts on this blog. My night out was incredible. I didn't realize until we were sitting at the restaurant table enjoying our food how truly relaxing it was to be able to focus on enjoying my meal and talking with my husband. No one was screaming or whining. No one was asking me to cut up their food into tiny bird-size pieces or to get them more milk, more Parmesan cheese, more bread, and no more broccoli. I didn't have to beg and plead anyone to please at least try the chicken, or have to cut my meal short because someone needed to nurse, or to be walked around the house in the Bjorn. I liken the experience to a two-hour vacation, even though we were a mere 30 minutes from home, didn't pack a suitcase, and were sober the entire time. We ate and ate and ate until we were stuffed. We had dessert, something we rarely do when we go out, and it was awesome. And of course, we brought home two slices of chocolate peanut butter torte for my two incredibly generous, selfless friends. Jenny and Kellie, thank you, thank you, THANK YOU! The twins were...the twins. We put them to bed before my friends arrived, and just before we left, Luci woke up. So we left her to be rocked back to sleep (which ended up not happening until she received a bottle about an hour or so later). Nicholas slept until it was time for his bottle, so at least he was good for them. This morning the hubs made pancakes, and afterwards I went for a run outside in perfect, sunny, 40-degree weather with The Smiths' "Sing Your Life" playing on my iPod. And even though everything in my life went back to its normal insane state today, I feel more like me right now than I have in quite some time. Around 7pm tomorrow evening, I am leaving my house. In a shirt that doesn't feature streaks of baby puke and pants with nary a speck of smeared applesauce or yogurt on them. 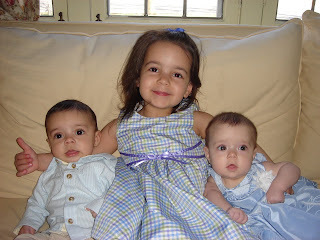 And without my three little darlings. Two of my nearest and dearest friends made the impossible dream a reality. For my birthday, they bought me a gift certificate for dinner at our favorite restaurant. They are watching the Triple Threat so that the hubs and I can go out to celebrate my birthday. They have been warned, and they are accepting the challenge anyway. They are either the best friends on the planet or certifiably crazy. My level of excitement for this event borders on the manic. We have not been out to dinner sans children for over six months. I'm contemplating locking them inside my house to prevent them from fleeing in terror or exasperation...Right after I kiss them and hug them and promise to name my next child (ha!) after both of them because I am grateful beyond words. The April issue of Root & Sprout, the completely parent-driven website where moms and dads can find content to help with raising their families, is now live. 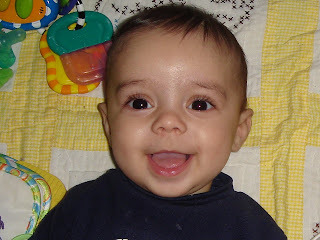 And an essay on my experience with motherhood after infertility. 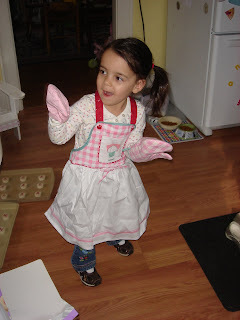 Let me know what you think, either by commenting on Root & Sprout, or right here. And if you haven't yet joined Root & Sprout's own social networking, Grow Together, where parents can interact with each other to share stories and advice, please consider doing so!